Our bunkhouse is available on a ‘per night’ basis and is specifically designed to cater for individuals or larger parties of walkers and cyclists, some of whom may be travelling along the Herefordshire Trail, the Malvern Hills or in the Forest of Dean. 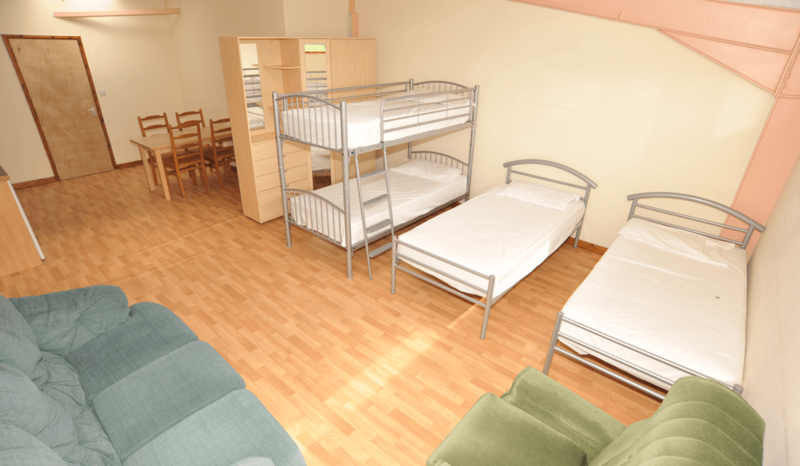 The bunk rooms are available to book as a sole use option to ensure all rooms are occupied by your group. Toilets, showers and the communal area are shared with guests that are camping. Each room is furnished with a wardrobe, dining area and cooking area. The cooking area has a kettle, toaster, microwave, 2 ring table top cooker, fridge, basic cooking equipment, sink with drainer and utensils and crockery. We have 5 rooms: the family room has twin beds and 2 bunk beds; one room has 4 single beds; two rooms have 3 beds; and one room has twin beds. Toilets and showers are on the ground floor and shared with other guests.